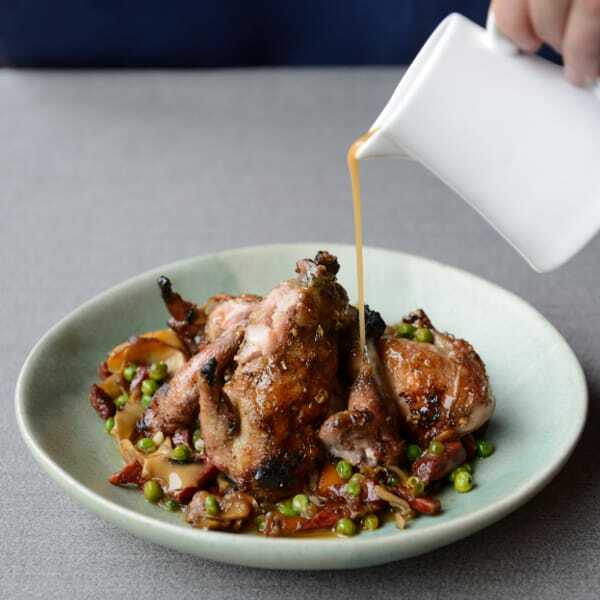 You might have arrived here after seeing the quail recipe in our cookbook (Quail with Pearl Barley, Chorizo, Mushroom & Peas, page 99) and need some help with the deboning. A video link is below but first some info on this delicious poultry. Quail is very nutritious – of course it is a protein but there is much more to a quail than that. A serving contains excellent quantities of minerals such as phosphorus (helps kidney function, cell growth and bone strength), iron (necessary to form haemoglobin and transporting oxygen around your body) and zinc (key to good immune function and wound healing). It is also packed with vitamins such as niacin, B6, riboflavin, thiamine and even a decent amount of vitamin C.
More flavoursome than most chicken it lends itself well to robust seasoning and char grilling. Using Indian, Moroccan or Spanish flavours are my favourite ways to season these birds and I always try to grill them over charcoal as the wood smoke adds another great flavour. Quails are commonly eaten complete with the bones, since these are easily chewed and the small size of the bird makes it inconvenient to remove them. Er I disagree! Whilst I would consider serving quail completely on the bone, I would be very sure to tell the eaters that the bird contains many small bones and if “chewed” and swallowed could end up with a rather hurried visit to A&E. Not a great end to a dinner party. I do like partially de-boning quails to remove the breast, wing, ribs, back bone and thighbones. Then leave the drumstick on as the bones aren’t too tiny. Until you have undertaken the de-boning process a few times it can seem fiddly, but I recommend learning to do this on a quail because once you have the hang of it, it is the same for any type of poultry and having this skill under your belt for chicken and other birds is something that can allow you to cook these in a host of new ways. I was going to post my own video on how to de-bone a quail, but after reminding myself of the video I learnt from I came to the conclusion that I could do no better job and certainly didn’t have as nice a French accent as the legendary Jacques Pépin. He has a number of great videos on de-boning poultry but this one on quail is particularly useful. Also let us know if you create this dish!